There are many German freight villages which have been successfully positioned and established itself in the market. But what is their position in the European ranking? Could the strong market position be maintained or could there be something to learn from the experience of other European freight villages? These questions became the subject of the study. The study of the DGG entitled „Positioning and Establishment of the Freight Villages (FV) in Europe is the second of its kind. The first one was carried out by the DGG (involved by the institutes ISL and LUB) in 2010. The current study presents the state of development as well as the development perspective of the European freight villages. The aim of the data collection is to give an overview to the actors of the single locations about the international field of logistics and to encourage the further development of macro logistics concepts in Europe. In the beginning of the survey, over 200 locations from over 30 European countries were identified and contacted. The current ranking includes 40 Benchmarks / Key Performance Indicators (KPI) divided into sixteen clusters. The assessment criteria were expanded by the latest and urgent aspects, as “Green Logistics” and “Security Management”. Furthermore the position within the TEN-T corridor was observed to take into account the future freight flows in Europe. Compared to the first European ranking in 2010, there is no change in 2015 among the TOP 3: Interporto Verona (Italia), GVZ Bremen (Germany) and GVZ Nürnberg. Besides the again good positioned locations, the Freight Village Berlin Süd Großbeeren can be seen as the “real champion” of this ranking, improving the ranking place from the 10th in the last ranking to the 4th in the current ranking. Another notable location is the freight village Leipzig which improved and got ranked within the “Top 10”, due to high number of measurements in employment and in the field of “Green Logistics”. The outstanding success of German Freight Villages is justified through the high Value Added Services that affect positive the employment level, high level of development as well as a high level of terminal capacity. The locations indicate also a remarkable market share of the total supply of real estates in the region. 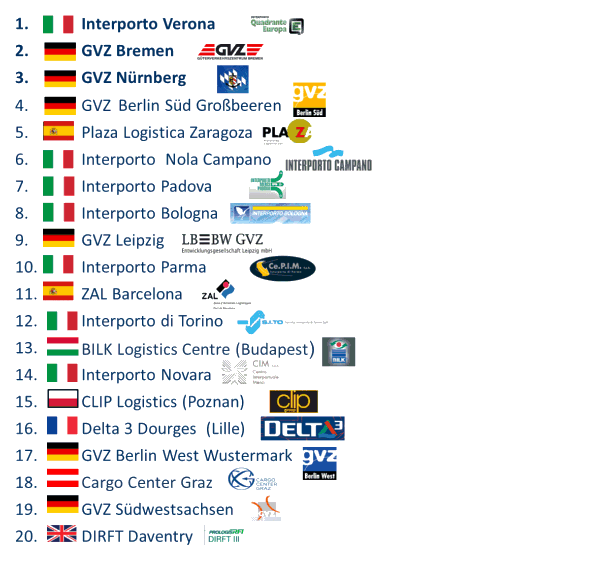 Beside the German GVZ the Italian Interporti are the leading locations in Europe and therefore represent the international performance standards. A high share of combined transport is concentrated in the north of Italy. The Interporti (Italian name of freight villages) in this region operate as important gateways for the trans-Alpine traffic. Spain is one of the pioneers of successful establishment of the Freight Village idea. The PLAZA Logistica Zaragoza for example reached 5th place. This was primarily due to the intensive use of the airfreight interface directly established within the FV: There, the global logistics processes of the textile manufacturer Inditex are concentrated - among other things, responsible for the also in Germany very successful fashion brand Zara. In addition to Germany, Italy, Spain and Eastern Europe, also Delta 3 Dourges (France), Cargo Center Graz (Austria) and DIRFT Daventry (UK) ranked among the top FV. But also in Eastern Europe the formation achieved success. So two locations from Poland - CLIP in Poznan - and from Hungary - BILK in Budapest - could improve and reached the “Top 20” as well. Funding for railways and intermodal terminals promote the development of Freight Villages, as for example in Poland. The automotive and logistics supplier are the main consumer of services the East European Freight Villages providing their development. The logistics real estate companies use also the favorable location of freight villages and offer their services to achieve PPP Solutions. By contrast with the ranking 2010, the stage of development, not only throughout Europe, but also in the single countries and the Freight Villages themselves, has increased noticeably. Some new Freight Villages entered the current ranking. This success proves the success of freight village concept and promotes its development in Europe.